Good morning, lovely people!! 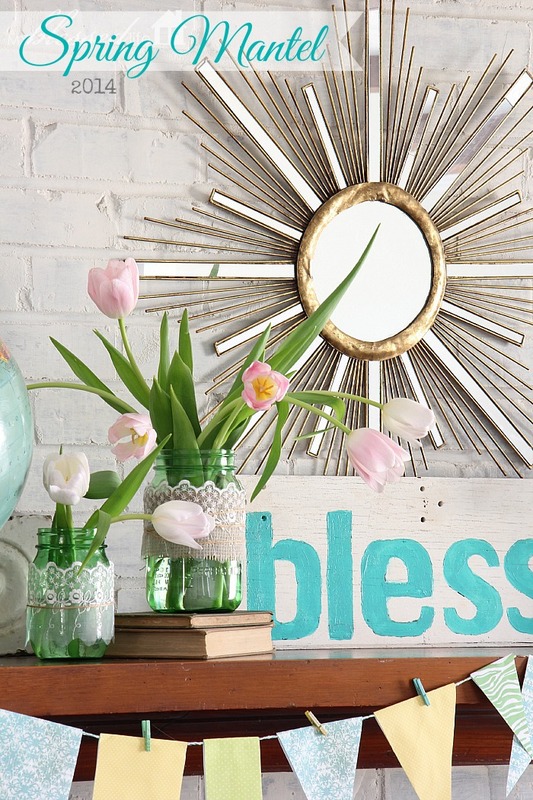 I’m so excited to share my bright and happy Spring Mantel with you today. I’ve been needing to do a little “creating”, so putting the mantel decor together was the perfect outlet. The weather here in north Alabama has been so beautiful with highs near 70 degrees the past few days. Having the windows open with spring breezes blowing through the house is so good for my soul. 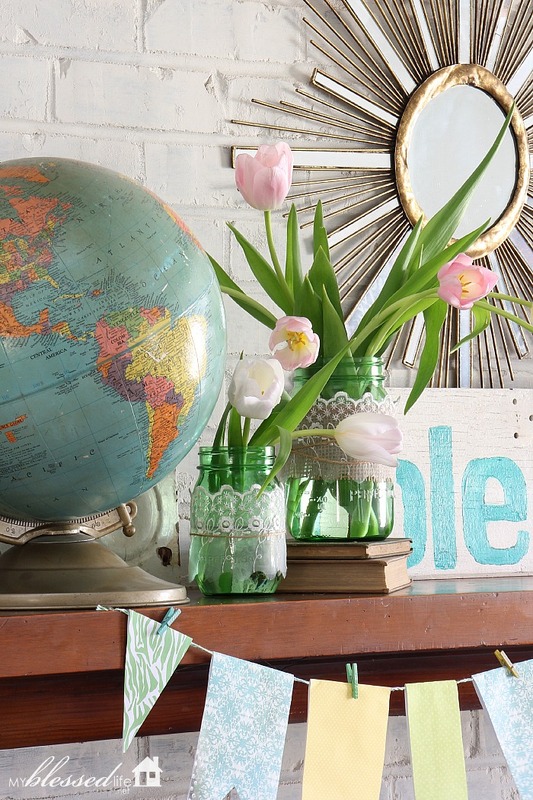 This year’s Spring Mantel decor is simple and unpretentious…just the way I like it! SO pretty, right? I love all the different textures and happy colors! 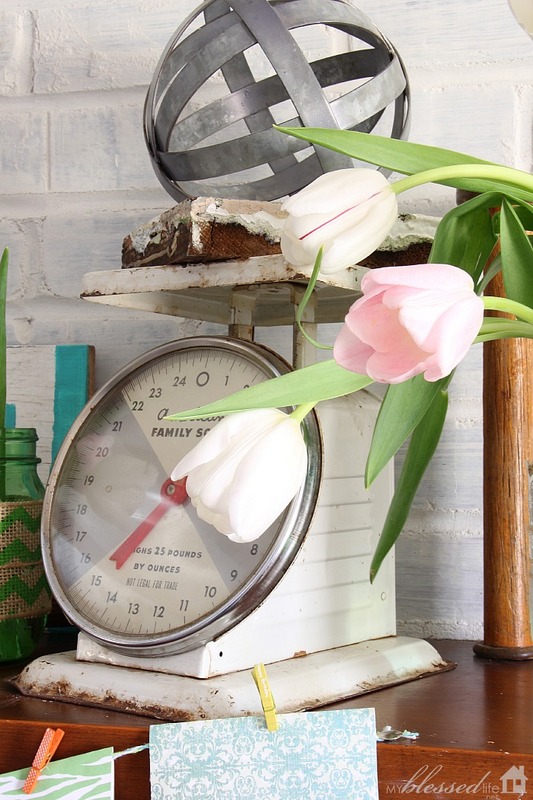 I used my vintage scale, wooden spools and pretty tulips. If you haven’t guessed it by now, tulips are my favorite flower ever. I adore these vintage green Ball jars. They are a limited edition of Ball Heritage Collection Spring Green Jars. You can get them in either regular mouth pint or wide mouth quart. I just wrapped them with burlap, lace and twine and I think they are just lovely. 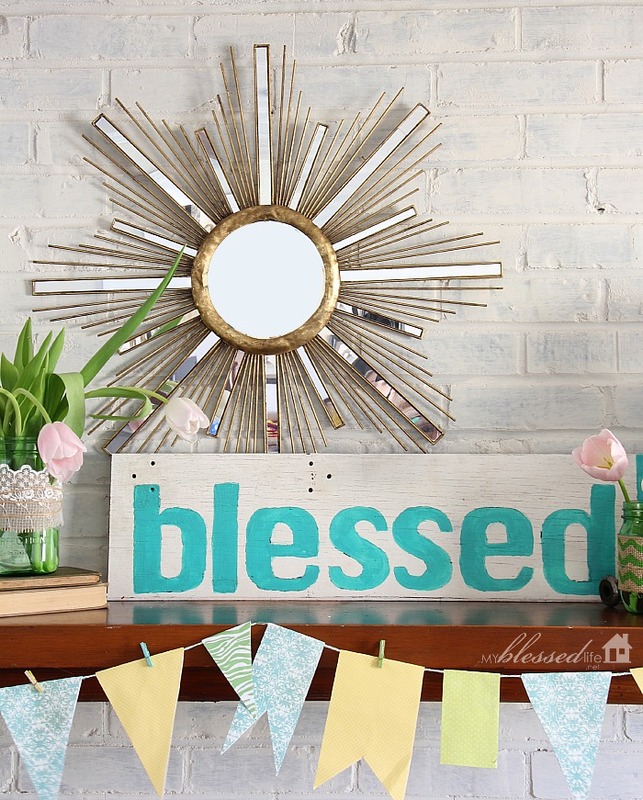 The “blessed” sign came from one of my favorite places – Southern Accents Architectural Antiques. It’s made from salvaged wood…and the word is pretty perfect. 🙂 The folded paper banner is from last year’s Spring Mantel. It is SO quick and easy to make…and for less than $5. Yes, I still love chevron. I know people say it’s going “out”, but a little here and there makes me smile. I think this is such a fabulous combination of layers and textures. On the back of the Ball jars, the date is embossed along with 100 Years of American Heritage and Made In USA. 🙂 Why do lace and burlap just look so awesome together?! I haven’t ever mixed different colors of tulips before, but I really like the pink and white together. The globe is quirky. The flowers in jars are romantic. The sign is rustic. The starburst mirror adds a little bit of glam. That’s my Spring Mantel for this year! 🙂 I hope you’re inspired to freshen up things at your house for Spring. 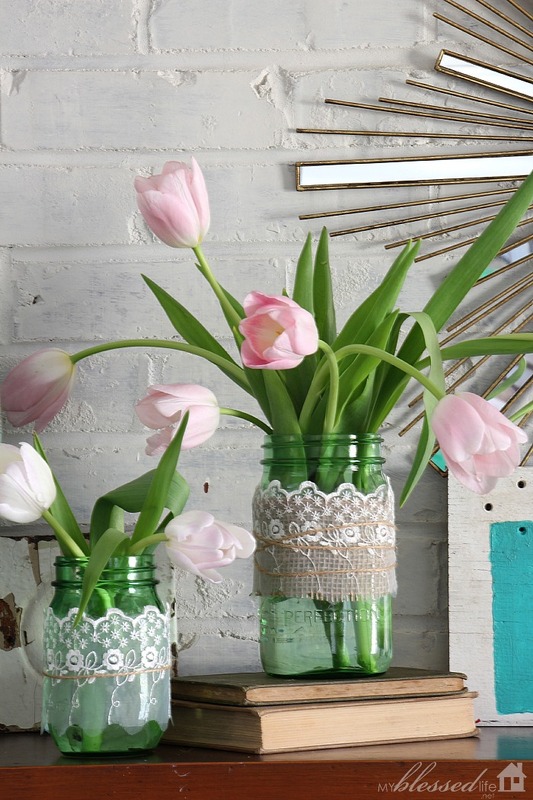 Put fresh flowers in jars. 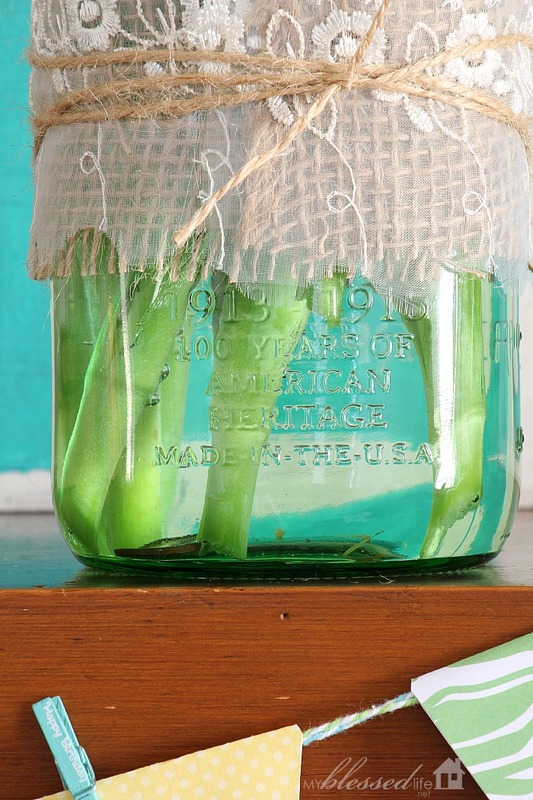 Buy some new vintage-esque green Ball jars. Etc. 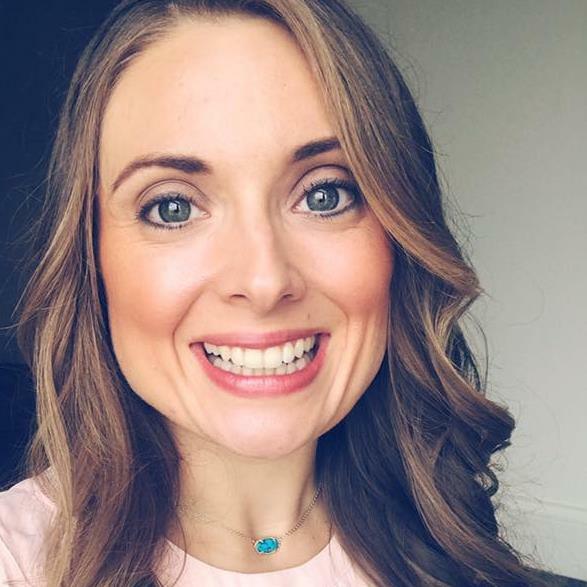 Are you DYING for Spring like I am? So cute – I especially loved the colored Mason Jars with fabric – I could even do that and spruce up my look! Thanks for the ideas Myra! Thanks for sharing…Hope your week is blessed! I love the paper banner and mason jars–I’m totally going to use your creative and beautiful ideas! Your mantel looks adorable! Makes this winter loving gal ready for spring. Mantle is beautiful!! 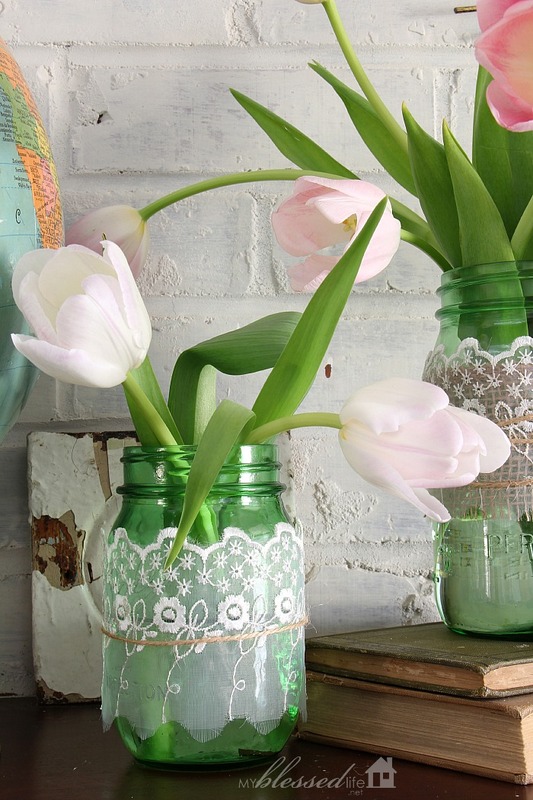 Love the mason jars with the flowers. Incredible mantle!! Love it!! 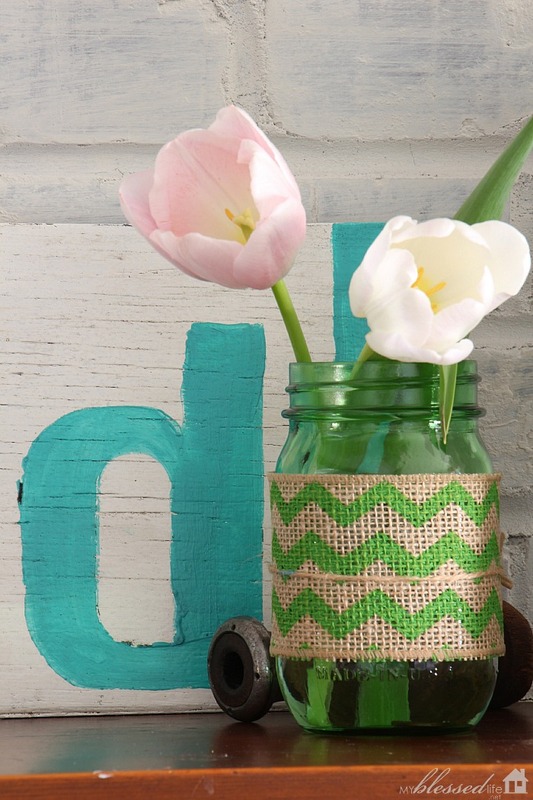 I adore your spring mantel! The layers and texture is gorgeous. 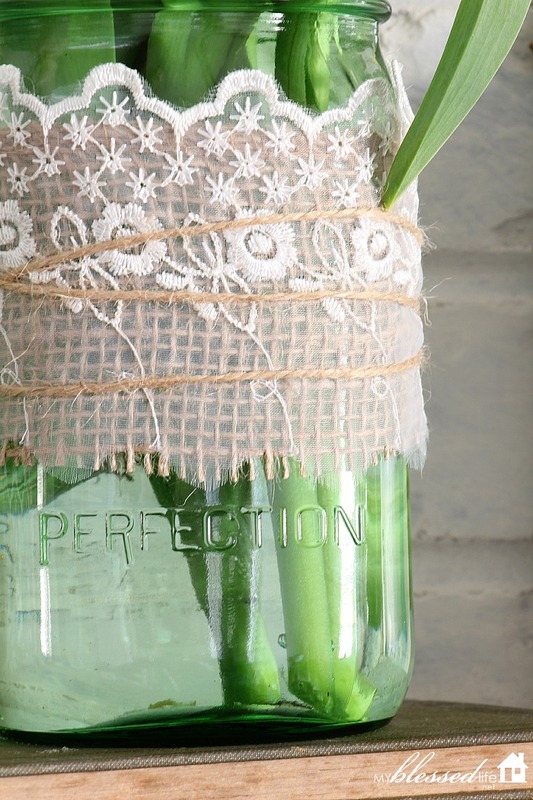 I am putting together a round up of fresh spring decorating ideas on my blog Lovely Etc. 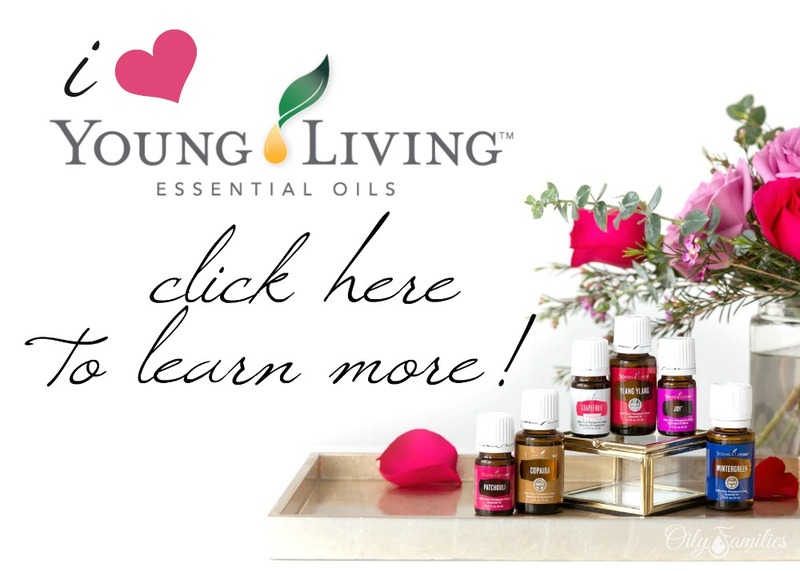 this Wednesday and would love to include your mantel. (With a link back to you of course). Please let me know if this is ok. Thanks! 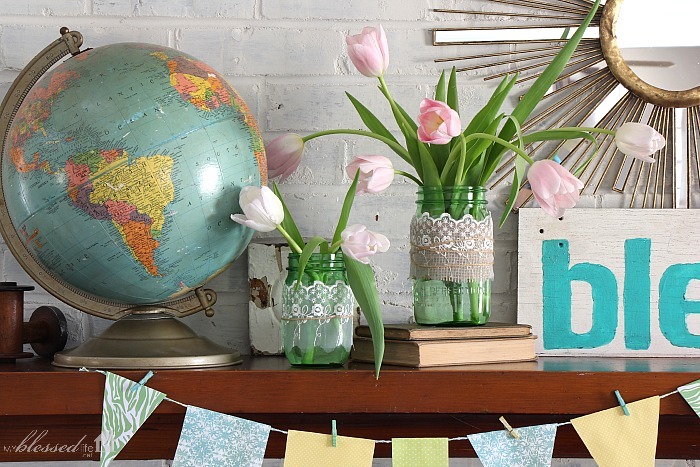 Spring mantel is always awesome to celebrate because through we can decor our house.